Sadly, the Depreciating Rand has resulted in a price adjustment here. The new prices are now reflected. Delivery to any physical address in RSA by Economy Courier (3-4 days) is around R160 for both items. These prices only apply to 4x4 owners, in order to help them enjoy their hobby more. Commercial prices on any other radio equipment on request. Gonna check with my Cruiser Mate, think we shoulg get a set each soooooooon! Recently we sold two GME GX300 29MHz AM radios, so I took the opportunity to put them through their paces and test their technical ability. I was always of the opinion that the radios looked nice, but were somewhat over-priced for what I consider vintage technology. But was I surprised!!! The Radio features an excellent quality receiver and even with the squelch fully turned on, still retained a most respectable sensitivity figure. The adjacent channel sensitivity was well within recognised limits and then casing is splashproof to IP55 standards. The radio controls are concise and well laid out. The transmitter RF out put is slightly lower at just over 4W compared to the Dragon's RF output at 5W, but the superb receiver more than makes up for that - this radio will not stand back for any other 5W 29MHz AM receiver. The GME GX300 can be programmed (by an Authorised Dealer) for either 27MHz or 29MHz usage, but not both at the same time. The casing is quality UV resistant and is available in either black or white. The pictures below do not do justice to the actual product. I will have to make a bracket. Will take some pics as we go along. 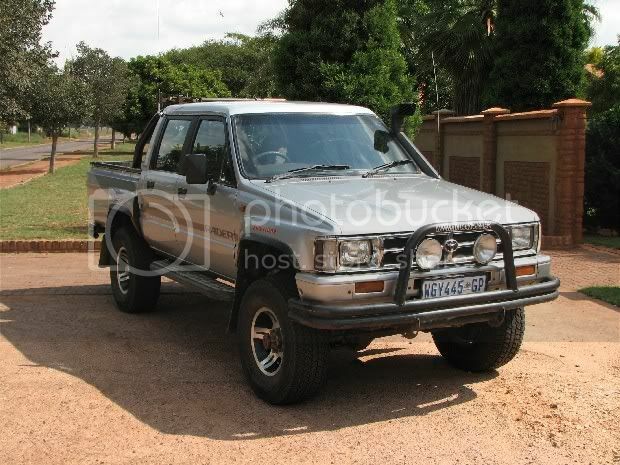 Vehicle: '91 Hilux DC 4x4 3.0L KZTE Eng. F_D, I will take a GX300 black one very soon. 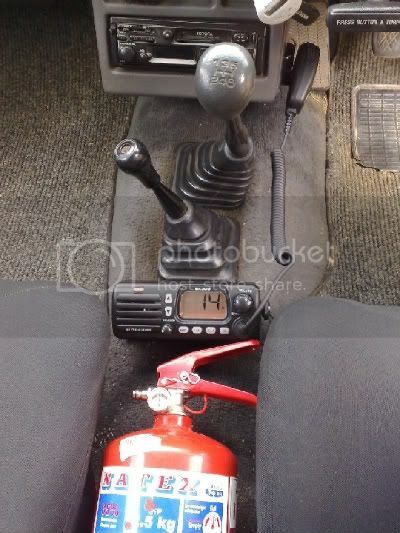 The other unit is a Motorola GM360 VHF radio, remote mount. Here goes and remember I did not want to dril new holes so here it is. The bracket still need to be sprayed. Very nice! Your antenna installation looks neat! Could you test it with anyone? Thanks Eric. Didn't get the chance as noby else in the convoy had AM radio's and we got back to late to Bennie's place to test with his. Niel, You should've switched on your radio. I called and I called by you didn't answer. My call sign is ...... ... can I call a friend? Ok radio, all done and finally completed. 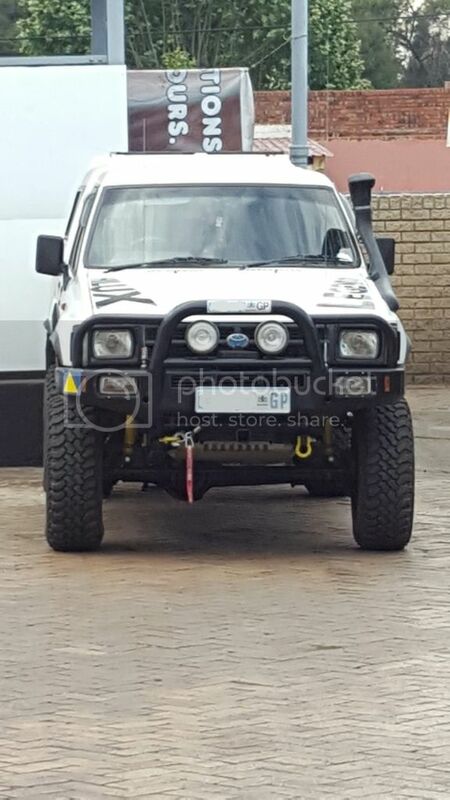 Moenie worry nie Cassie ons kan dit eerskomende naweek toets as ons Klerksdorp toe gaan. Just want to find out from you ,do you still have the 29mhz radios the gx300b_ price were R1060 I think arial R300 and is it already setup or is that extra also how long would it take to get 2 of these . "As long as power flows through any of my circuits ill 4x4." This week's stock is sold out, but I will have new stock next week. The GX300 is still the same price, but the antennas are now R320.00. if not i will contact you . I've been testing a new Mobile 29MHz antenna. The differences are that it's only rated at 50 watts instead of 100 watts - but we only transmit at four or five watts, so we can live with that! However, the main difference is that it is 500mm shorter than the standard 29MHz antenna that we have been using, thus far less interference from garage doors, trees etc, and the price has fallen from R350 to R285. Will the base of the antenna stil fit on the body mount antenna or will you have to reinstall the section fitted and attached to the body? Bennie jys obvious slimmer as ons. ek wil ook weet (soos neil)???? Eric wen are you going to share your oppinion on the nuvi with us ??? Niel, you can use your exuisting Mobile Antenna base, i.e. the "swivel" part. You just remove the moving part of the swivel with an Allen key, and fit this one in its place. The steel whip is more rigid than the original one and it does not whip around as much as the longer one does. Blom, the Nuvi 710 is a brilliant GPS in its own right, warns me where possible speed traps are. But as far as off-roading goes, I don't know what to recommend anymore, definitely not the Nuvi range. I guess the Garmap 60CSX might be worth considering, but then you would require an Auto mount kit for it. The GPSMap 276C is still available, but at a price. Tracks for Africa. T4A concentrates on tracks and trails, rather than tarred roads. It's compiled from data sent to T4A by people who travel to the more remote places. Brilliant for travelling off-road. You can download a demo from their site. With an external SD card, yes. But any Nuvi below the 710 does not display "bread crumb" tracks, so I son't know how well it might work, never tried it. Niel wrote: Will the base of the antenna stil fit on the body mount antenna or will you have to reinstall the section fitted and attached to the body? The South African manufactured range of Mobile Antennas mostly use the chrome swivel type adaptor as shown in the picture. This type of antenna is suitable for side-mount or top-mount, as the swivel can be locked in any position. The whip & coil assembly is mounted on a matching unit that screws onto the base unit and is fixed by an Allen screw. The whip can be removed when necessary, such as when parking into a garage. The Compact whip assembly will fit directly onto this mounting. F_D, is it possible to buy the rubber base for those mounts seperately? The previous owner of my lux had radios it would seem, as I have a mount on either side of the van. Problem is now that the rubbers are desentigrating due to weather and when it rains..........well you get the picture. I have no idea if the cables still run under the carpet , I have never looked. Problem is I can't take them off as then I have an even bigger hole to deal with, so I would like to replace just the rubbers. If not then silicon will have to do. Are you talking about the sealing rubbers that one pops in when removing an antenna? There are rubbers available, the type we used to use was excellent, but the newer ones are not as good as the original ones. We do have them, if you are talking about the rubber "hole plugs" only. I was actually thinking of just replacing the actual mounting rubber, the black bit under the metal bit in the first pic. But now that you mention it, perhaps I should just remove them all together and put a in a hole plug until such time as I need a radio. I just hope whom ever did it didn't hack it and that the hole is not a mess. Whats the cost and who else would stock it, builders perhaps? PM me your address, I'll send you a couple of them. Thanks Eric, I really appreciate it. When it arrives I will take my snail and fetch it I will let you know when it has arrived. i got my GX300 yesterday, thanks very much. I've only used a radio a few times being the dragon. My boss has the GME so i knew it would be a good buy. When i opened the box i thought to myself wheres the radio? I knew it was "light years ahead technology" to the Dragon but didnt think it would be that small...which made me even happier! My pleasure! The radio certainly is minute compared to anything else (well, only the Dragon now!) that is on the market. I am looking to buy this radio for my husband. We are in Cape Town. What is the price to courier? Ek het n GME en het dit sopas geinstalleer, maar nou is daar 'feedback' op die speaker as die voertuig af (geen sleutel in ign) en die radio ook af is. Ek het grond en antenna getoets en als is reg. Antenna coax loop glad nie lanks enige ander lewendige drade nie. Kan 'n fout wees op die radio self. Maak eers seker die kragkabel vir die radio direk na die battery toe gaan en geen ander plek nie.